"Welcome to Fernfield, where we like to say, everything is possible." Having reviewed nearly all of the entries in the Air Bud franchise, I guess I might be somewhat of an expert. There's been a three-year lull since the last one; the first two played in theaters, and the rest have been direct-to-video releases. While the formula hasn't changed much for Air Buddies, we do get a different slant on things (puppies! ), and this slight bit of freshness is enough to keep the in-your-face cuteness from being entirely annoying for parents. This time around, we're introduced to Air Bud's family by Sniffer (the late Don Knotts), the sheriff's old dog. Buddy (Tom Everett Scott) and his five puppies live with young Noah Framm (Slade Pearce) and his family, while canine matriarch Molly (Molly Shannon) lives with her owner, Henry (Christian Pikes) across the street. There's Rosebud (Abigail Breslin), gold-chain-wearing gangsta' B-Dawg (Skyler Gisondo), meditating Buddha (Dominic Scott Kay), always dirty Mudbud (Spencer Fox), and the rotund Budderball (Josh Flitter). When the Framm's decide that it's too difficult to raise all five puppies, they proceed to find good homes for them. Noah can only watch as Jackie (Cynthia Stevenson) and Patrick Framm (Richard Karn) interview applicants to adopt the dogs. With all of the attention on the puppies, it's fairly easy for the evil Selkirk Tander (Holmes Osborne) to nab Buddy and Molly for rich kid Bartleby (Tyler Guerrero) who gets everything he wants. It's up to the dynamic dog's puppies to save him and Molly from the clutches of Selkirk and his henchmen, Grim Tander (Trevor Wright) and Denning (Paul Rae). This is pure Disney fluff, aimed mostly at kids, but, as always, claimed to be "fun for the whole family." Kids will lap this stuff up, but aside from a few "how cute is that puppy" or "how did that dog do that" comments, parents will spend more time looking at the clock than at the screen. It should be noted that the film is rated PG for some "mild rude humor," and the folks at the MPAA aren't kidding around with this distinction. There is some unnecessary albeit harmless scatological humor that truly adds nothing to the picture's comedy value, but Disney knows what kids want, and, sadly these days potty humor is in order. There's no denying that the dogs are the only reason to give Air Buddies a look, as the human performances are pretty dreadful. The only tolerable work comes from Cynthia Stevenson (Happiness), who is also the only believable character in the mix. The dog snatchers are the epitome of bumbling goofs, and we've seen far too many variations on Home Alone to put up with this sort of plotline. Still, it's difficult to argue that the real stars of the show, the pooches, are incredibly cute and difficult to turn away from. Plus, when the Air Bud formula has worked for this long, there's really no reason to mess with a good thing. Image Transfer Review: The 1.78:1 anamorphic widescreen image is surprisingly vibrant, with amazingly crisp, sharp images that are rich in detail. This is a direct-to-DVD effort, mind you, but that doesn't keep the rich colors from bouncing off the screen at every turn. Accurate flesh (and fur) tones, along with solid black and contrast levels are enhanced in this flawless transfer. Audio Transfer Review: The Dolby Digital 5.1 is another nice surprise, providing dynamic sound that is buoyed by active surrounds and deep, aggressive bass. The music benefits quite a bit from the track, while the dialogue is crystal clear and crisp. 9 Other Trailer(s) featuring Peter Pan: 2-Disc Special Edition, Meet the Robinsons, Cinderella III: A Twist In Time, The Fox and the Hound 2, The Little Mermaid III, Tinker Bell, High School Musical: Remix, Disney DVD Game World, Yin Yang Yo! Extras Review: Other than sneak peeks for other Disney DVD releases, we also get a music video for We are Family by Jordan Pruitt, and a trio of featurettes. The first runs for just over four minutes, Hollywood Backstage Pass with Air Buddies, which gives us as much behind-the-scenes information about the making of the film as can be squeezed into such a short timeframe. Train Your Dog to Be a Star has puppy training tips from experts Jordan Heppner and Rowan Harland. Puppy Profiles takes a brief look at the different puppy stars. The most useful information here is that Rosebud likes "Brad Pitbull." 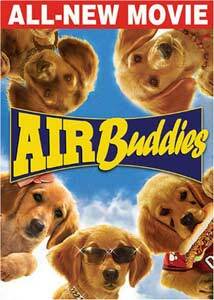 The further adventures of everyone's favorite canine athlete continue in the direct-to-DVD feature, Air Buddies. Focusing mostly on Buddy and Molly's offspring, this incredibly cute adventure is more of what families have grown to know and love from this Disney franchise. The DVD is rather light on extras, but the audio and video are surprisingly exceptional.